Anne Klein black suede evening shoes. T-strap with buckle closure. Heels 3.5". Made in Italy. This Anne Klein Dress Shoe feature a Suede upper with a Pointed Toe. Leather suede upper. Made in Italy. 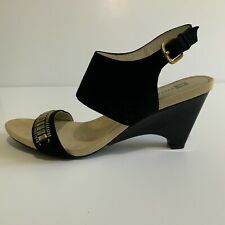 Anne Klein Rio Slingback Retired / Discontinued Black Size 10.5M US Suede Leather Upper Gold-Tone Chain Embellishment on Toe Strap Open Toe & Heel Silhouette Adjustable Buckle Slingback Strap Contoured Covered Heel - 3 Inches New Without Box, Never Worn Please see pictures for details. Feel free to contact me with any questions! ITS BEEN USED WITH CARE. A GREAT PIECE FOR YOUR COLLECTION. SIZE 7 1/2 B. They are gently used and in very good condition. They are PLUM in color. They say they are leather upper, balance man made materials. Anne Klein. 2 eye lace up. Size: 10 M. Minor scuffs on fronts. Heel height: 3 1/2". Anne Klein Akeris Heels Square Toe 7 M Black Suede 3"
Anne Klein Akeris. Black Suede. Square Toe. Very Good Condition; slight front creasing; light sole & heel wear. Career Professional Shoes. Pre-Owned Shoes will have varying degrees of scuffs, scratches, and wear on the uppers and soles. scuffs, scratches, and wear may include not limited to dents, nicks, creases, colored markings, scuffs, scrapes, stains, dirt. I would appreciate a positive review to keep my record in good standing. In Good Condition with some nicks on heels (Please See Photos for More Detail) Photos in this listing are of the actual item(s) you will receive Very Cute Pumps, in good condition other than the nicks on the heels. The left shoe has only one very slight nick in the heel and the right shoe heel has several small nicks.. The shoes other than the heels are in very good condition. These could be either work as is or the heels could be touched up or recovered easily. Reptile Design Pump Heels. Suede Leather. Suede Leather upper. Man Made lining. Balance Man Made. This cute pair of ANNE KLEIN brown Suede shoes. Soft burgundy brown suede uppers. Sole Long 10"; Wide 3 1/4"; Heel 3". Note: Photos are of actual item. Colors will vary due to bright photo lights and reflections and screen resolution. Anne Klein New York Suede Mules with Fur. Black Suede. Leather tie. Ribbon detail. Size – 7 ½ M.
They are suede and brown in color. They are a size 10M. Style: Esteria. AK Anne Klein. Color: Black Suede with gold heel and lining. Heel is about 3.5", hidden platform is about 3/4" tall. Cognac BrownSuede Peep Toe Heels. ANNE KLEIN. Tried on display but new. DESIGNER ANNE KLEIN N.Y COUTURE LINE HIGH FASHION HIGH END RED SUEDE ANKLE STRAP HIGH HEEL SHOES. SUEDE UPPER. LEATHER SOLE. MADE IN ITALY. LEATHER LINED. Condition is New with box. NEVER WORN. Lovely pair of Anne Klein suede slingbacks. The color is a raspberry / pinkish red / burgundy / wine. In very good condition. ANNE KLEIN BROWN SUEDE HEELS 6 1/2M Condition is very good Pre-owned. Shipped with USPS Priority Mail. THERE ARE NORMAL PRE-OWNED WEAR MARKS AT THE UNDER-SOLES AND A LIGHT SCRATCH AT THE TOES. OTHER WISE, THEY ARE IN GREAT SHAPE. I WILL RESPOND ASAP! IF YOU NEED MORE INFORMATION ABOUT THIS ITEM! NEW without box. I will then send 📬 you an invoice. Adjustable buckle strap. Almond toe. 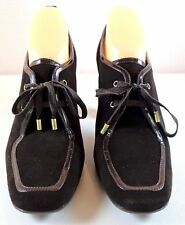 Genuine Anne Klein, beautiful black suede uppers with elasticized section around the top of the foot opening. Very dressy, easy slip on style. Worn once. 4" deadly heels. Size 7.5, made in Italy. Rich chocolate brown color makes them even more elegant and classic and make you feel like a lady. Uppers: Genuine Suede Leather. No visible wear. Heel Height: Approx. Small glue spot along right sole edge. ALL photos as I do my best to describe the condition of the shoes. Color: Black. Linings/Insoles: Light wear on linings and insoles. Well Loved but still Fabulous. All on a Leather Sole. These sleek heels offer classic style and a modest heel for maximum comfort. I flex technology for additional comfort Finished in beautiful suede. Will complement any outfit. Returns accepted. Any questions please ask. Thanks for looking! Pretty Anne klein 3.5 inch pump Sz 9, Taupe suede w/smooth leather & textured trim on heel. Shows no wear. Anne Klein blue suede Qadira with silver studs, size 6. Excellent pre-owned condition. Parts of the inside show wear, see pics. Shipped with USPS Priority Mail. Pointy toe design. High quality soft and comfortable suede upper with buckle detail at toe. Heel Height: 3.25"Stacked heel. Man-made sole. Owner now wears 6.5 includes original box. Anne Klein Brown suede peep toe heels with a decorative buckle and cut out sides Size 5.5 M Style: Akolita Really good condition, just a tiny bit of wear on the soles, otherwise A Insole 9" Heel 3.5" Ball of foot 3". Strappy, Slingback, Open Toe, Adjustable Buckle. Gorgeous & Elegant Anne Klein Strappy Pearl Embellished Heels - New in Box. Color - Blush Pink Faux Suede. Size 10M US. Heel Height 3.5" 0.5" Platform. Used but great condition wear on bottoms. Taupe Brown Suede Leather Uppers. Beautiful Slip On Pump Style Shoes Designer: Anne Klein. Smooth Leather 3.5" Heels & Swirl Toe Decor. Made In Italy. Inventory location: shoe shelf 10(4410. gray, size 10. Used in great shape. Has little to no wear on bottom of shoes. Our goal is to provide you with a Superior Product and Excellent Service. ).